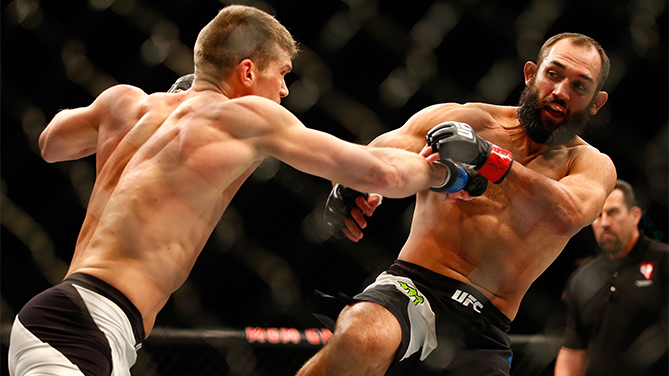 Who were the winners at UFC Fight Night: Hendricks vs. Thompson? Click below to get the results for all the fights at the MGM Grand Garden Arena on Saturday, Feb. 6, 2016. Stephen “Wonderboy” Thompson survived an early takedown by Johny Hendricks and came storming back with a barrage, which is probably an understatement, of strikes – kicks, punches, furiously fast combos – to take out the former champ by KO at 3:31 of the very first round. 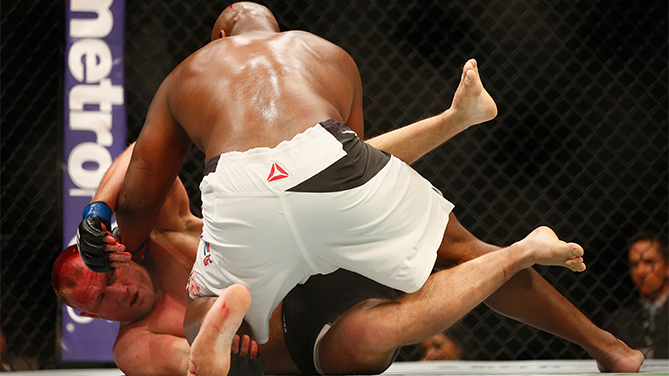 Thompson landed 32 of the 49 significant strikes he threw, overwhelming Hendricks with his output and awkward style. Thompson now holds the longest active win streak in the welterweight division with six straight. 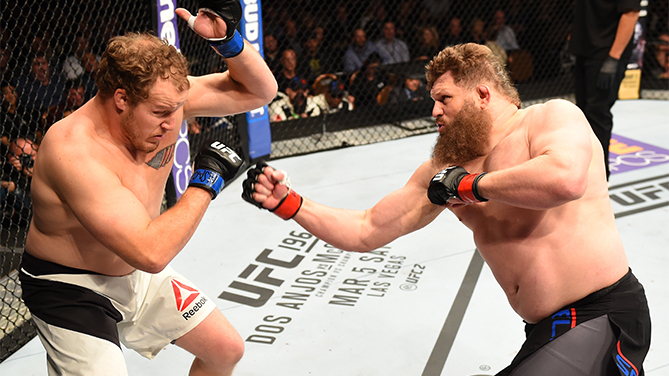 Roy Nelson vs. Jared Rosholt certainly won’t be in contention for Fight of the Night honors, but Nelson needed to stop a losing skid and he did just that, out striking Rosholt to earn the unanimous decision win (30-27, 30-27, 29-28). Nelson stopped both of Rosholt’s takedown attempts, forcing the wrestling standout to stay on his feet throughout the fight. Nelson improves to 22-12. Despite what appeared to be an ankle injury suffered in the first round, Ovince Saint Preux gutted out a unanimous decision win over Rafael Feijao (30-27, 30-27, 29-28). OSP landed 119/43 (total strikes/significant strikes) to just 35/11 for Rafael Feijao, who looked completely overmatched in the fight. OSP improves to 19-7 and wins his third fight in his last four outings. Fighting for the first time with Duane Ludwig in his corner since “Bang” left Team Alpha Male, Joseph Benavidez looked quicker and sharper than in recent outings, especially in the striking department. No. 1-ranked flyweight Benavidez took No. 8-ranked Zach Makovsky to school, scoring the convincing unanimous decision victory (30-27, 29-28, 29-28). Benavidez almost doubled Makovsky’s output, landing 108-56 in total strikes, and 91 of those were significant strikes for Benavidez. With Demetrious Johnson vs. Henry Cejudo announced for a flyweight title fight at UFC 197, Benavidez likely put his name atop the list of contenders following that bout. Misha Cirkunov collected his second UFC win in as many outings as he used an aggressive attack on the feet and on the ground to find a rear naked choke submission win over Alex Nicholson. The choke came at 1:28 of round number two. Cirkunov landed 88 total strikes in the onslaught to only 19 for Nicholson. 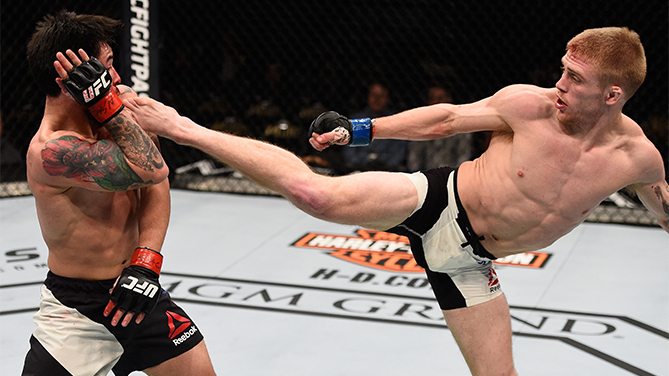 The Latvian fighter improves to 11-2 and a perfect 2-0 in the UFC with two finishes. Heading into the final round of Mike Pyle vs. Sean Spencer it looked to be anyone’s fight, but Pyle seized his opportunity when a spinning back elbow staggered Spencer and Pyle went on to swarm with knees and elbows to force the ref to stop the fight at 4:25 of round 3. Pyle breaks a two-fight losing streak. It wasn’t the most exciting fight of the night, but it was exactly what Josh Burkman needed as he edged out a unanimous decision win (30-27, 30-27, 30-27) to break a two-fight losing streak since returning to the UFC. 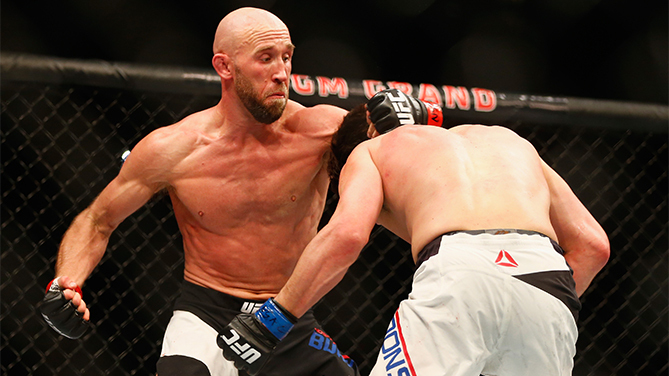 Burkman outlanded Noons in significant strikes, 58-39, and landed three takedowns in the fight. Derrick Lewis was not messing around in his FS1 prelim matchup with Misha Grabowski. 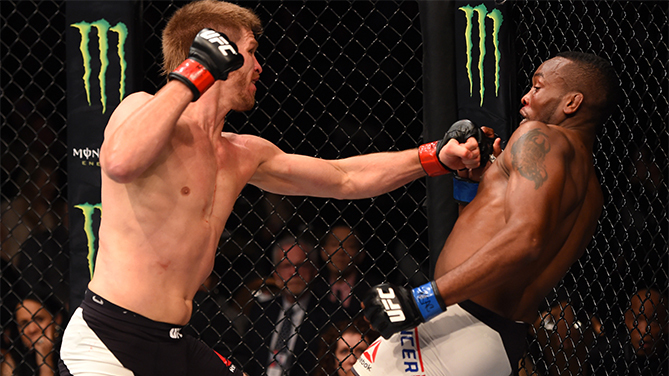 He came storming out in the first round and put it on Grabowski, who was making his UFC debut. The punishment from Lewis ultimately led to a first round TKO finish after the big man landed a huge right hand to a downed Grabowski for the win. After the fight, Lewis said he wants a top opponent and wants to keep things rolling. Justin Scoggins put on a striking, wrestling and jiu-jitsu clinic against Ray Borg to earn the unanimous decision victory (30-27, 30-27, 30-26). 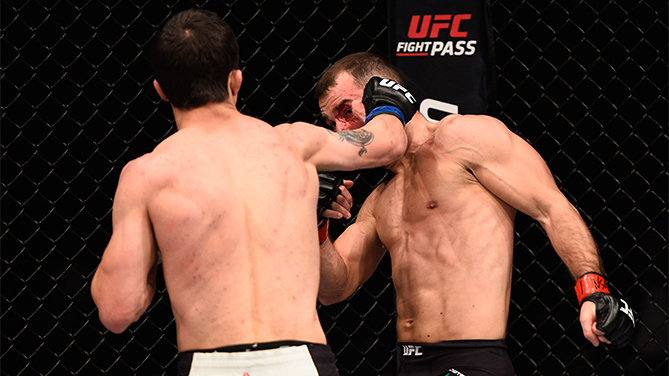 Scoggins’ striking was elusive and powerful – he outlanded Borg in significant strikes, 55-20. Scoggins also won the takedown battle 4-1 and defended every single of Borg’s desperation submission attempts in the fight. Scoggins wins his second in a row and may find his name in the top 15 of the flyweight division come Monday. Diego Rivas was on his back for the majority of the first round as Noad Lahat attacked with some killer jiu-jitsu. But the young Rivas stayed composed and when things got started in the second round, he came out with determination to make his time on the feet count. 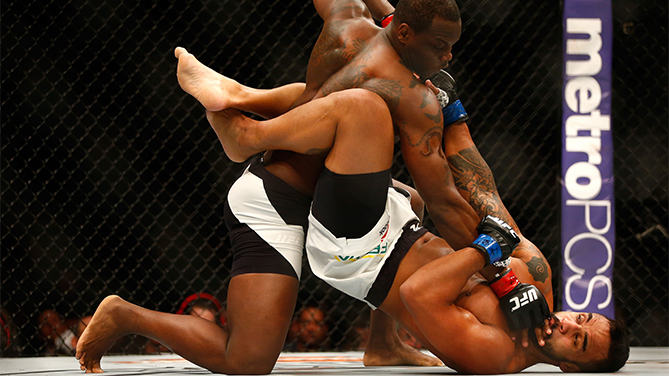 Rivas landed a highlight reel flying knee that KO’d Lahat on the spot just 23 seconds into the second round. Rivas improves to a perfect 7-0 with the big victory. It only took Mickey Gall 45 seconds to earn his date with former WWE superstar CM Punk on the UFC FIGHT PASS prelims main event of Fight Night Las Vegas. Gall landed a solid right hand that dropped Jackson. Then Gall swarmed and finished Jackson quick with a rear naked choke submission. Punk met Gall inside the Octagon and we now have the debut opponent for the crossover star. Every time Artem Lobov threw one of his signature hammers through the air, Alex White wasn’t there. White’s head movement was on point and he forced the "Russian Hammer” to work hard in what turned into a runaway win for White, who earned a unanimous decision victory (30-27, 30-27, 30-27). Lobov now falls to 0-2 in the UFC, as White picks up a needed win, breaking a two-fight losing streak to improve to 11-2 overall and 2-2 in the UFC.